The Minoura sbh-80 saddle water bottle cage mount attaches behind your saddle to hold an extra water bottle cage or a spare tube set. It is lightweight at only 80 grams, and is in a good position for aerodynamics. All bottle cage screws are included. Not compatible with i-beam type saddles, standard dual rail type only. Minoura hydration mounts are designed with the needs of both the racer and long distance bicycle rider in mind. 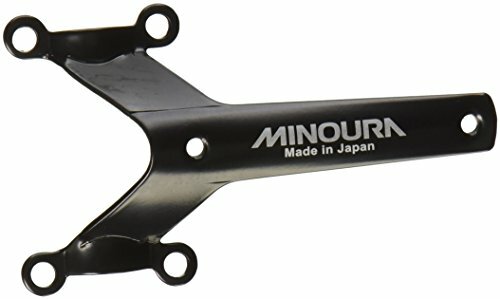 For 80 years, the family-owned Minoura of Japan has been a manufacturer of outstanding cycling trainers, ROLLERs and accessories. They are known the world over for quality craftsmanship and design and all trainers are made within Minoura own factory in Japan. 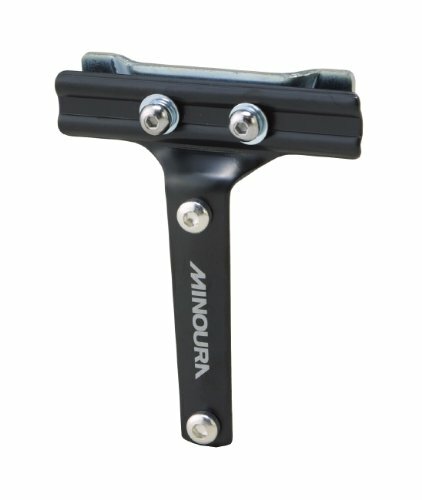 Known for unique designs, Minoura developed the first eddy current magnetic bicycle trainer in 1987 and the first rim drive trainer in 1994. Minoura is proud to introduce these new water bottle cages to the world. Made from a proprietary material called Super Duralumin, this cage's bars are 4.5 mm in thickness to allow for the greatest weight savings without sacrificing durability. Super lightweight at only 38 grams. 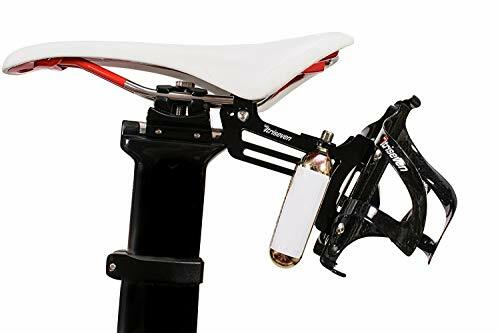 The Minoura bh-60 handlebar bottle cage holder features a U-shaped bolt system allows for mounting a water bottle cage on the exact center of your bike. Lightweight at only 65 grams, and with all mounting screws included, this makes it easy to place an extra water bottle within easy reach. 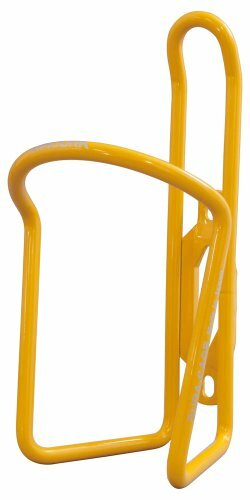 Only for use with standard 22.2 mm handlebars. Minoura hydration mounts are designed with the needs of both the racer and long distance bicycle rider in mind. For 80 years, the family-owned Minoura of Japan has been a manufacturer of outstanding cycling trainers, ROLLERs and accessories. They are known the world over for quality craftsmanship and design and all trainers are made within Minoura own factory in Japan. Known for unique designs, Minoura developed the first eddy current magnetic bicycle trainer in 1987 and the first rim drive trainer in 1994. 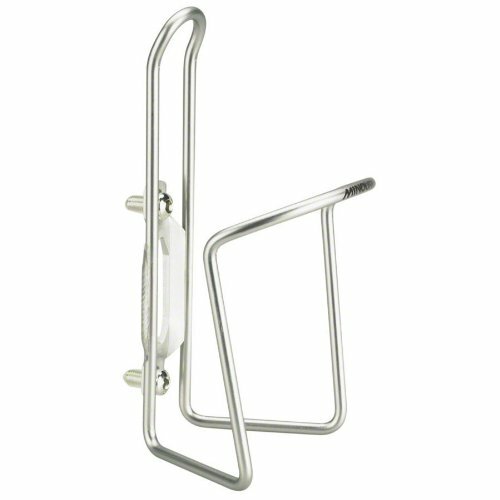 The VELOCHAMPION Double Cage Mount accepts a regular bottle cage and adapts to almost any desired height or angle. It is very secure once mounted properly and does not move or come loose. It is made entirely of metal, so it is very sturdy and durable. Hence it is capable of holding two fully loaded water bottles. It’s a great way to mount extra water bottles to your bike and it’s far easier to reach the water bottle when it is behind you. The clamps that hold the mount to the saddle rails move independently so if the rails of your saddle are angled at the end then it will still work for you. You will like the benefit of being able to independently angle each bottle. An easy to install product and very good value for the price. Stopping bottles jumping out Firstly, have the bottle cage at 90 degrees, don’t risk anything like 45 degrees – even if it is easier to get to. Use a standard size water bottle – 500ML (not 700ML or 800ML). Choose a water bottle which is tight fitting on the cage. Make sure you tighten the bolts to the correct torque. This will make it less likely to fall out. Test before a race! Go for a ride over bumpy terrain and see if your bottle stays in. If you test in a race you might find yourself one or two bottles down. It is the only plastic bottle cage bottle of 500cc size. The Minoura AB100-5.5 offers a lightweight and durable water bottle cage solution that is a step above the rest in the water bottle cage world. My thoughts on carrying a water bottle behind the seat. What works on gravel and what doesn't. 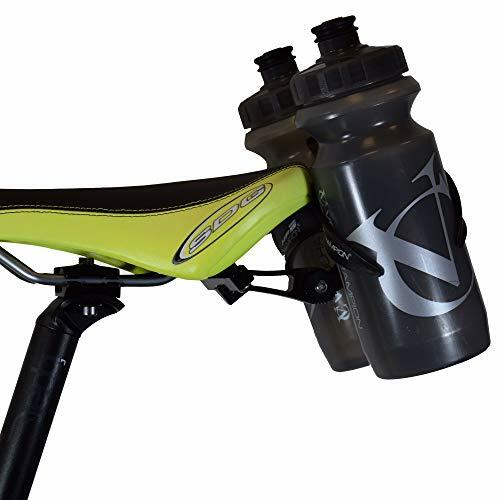 Want more Minoura Bottle Cage similar ideas? Try to explore these searches: Chefs Dishwasher Safe Knife Set, Beginner Bead Kit, and Orange Mint Tea.